Community radio for Syracuse and Onondaga County NOW BROADCASTING! IT'S OFFICIAL: WSPJ Syracuse 103.3 + 93.7 FM -- NOW BROADCASTING!!! The FCC has approved our new call letters "WSPJ-LP Syracuse". They are now absolutely official. We are bringing community radio to 103.3 + 93.7 to about 75% of Onondaga County, along with streaming, podcasting and video content to the entire galaxy. We picked new call letters for a new directon and focus going forward and our goal is nothing less than shaking up the established order of things in our hometown. Our fundraising and recruitment drives will be announced shortly. We have been approved for a 100 watt LPFM on 103.3 FM in Liverpool. This signal will be simulcast on our upcoming 250 watt 93.7 FM signal in the City of Syracuse. We are excited to have these overlapping FCC approved frequencies not only to finally move our programming into the City of Syracuse, but also into the northern suburbs as well. The next step is to build these new facilities and fire up the transmitters! We will have more details soon on our fundraising campaign to make this happen, but now it's up to us, as the FCC has finally approved us for signals that bring us to our long sought dream. Radio World is the leading trade publication for the radio industry in the US. So, we were rather pleased they just featured us in an LPFM update: http://www.radioworld.com/article/wxxe-plans-move-to-lpfm/272801. In the piece entitled, "WXXE Plans Move to LPFM", they reported, "In the right circumstances, an LPFM station license can be more attractive than a higher-power signal elsewhere." "Syracuse Community Radio has received a CP for 103.3 MHz along New York's Onondaga Lake after revising its requested frequency. It told the FCC it would divest itself of its noncom educational station WXXE(FM) at 90.5 in Fenner, N.Y., if it received an LPFM. It also has a translator in Hinsdale." "The station plans local news and commentary, local music, youth programming and other content. 'SCR has consistently provided this programming in the past,' it told the FCC, 'but over a very limited signal area at the outer fringe of the Syracuse area, resulting in greatly hampered listenership and participation.'" We appreciate the mention in a national publication! 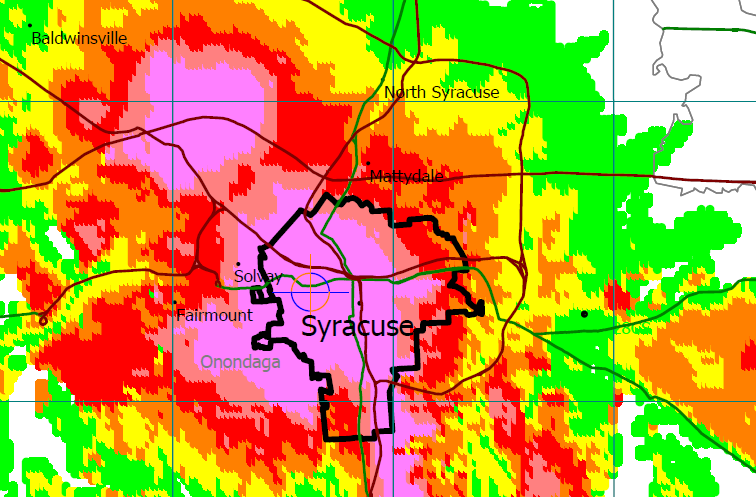 We have been approved for 250 watts on 93.7 FM centered over downtown Syracuse. The map above shows the expected coverage. This exciting development should finally allow us to realize our long sought dream of bringing grassroots, community radio to the City of Syracuse and beyond. We are now in the process of working out numerous technical details, but hope to be on the air by early 2015. The strongest portion of this signal will be over the City of Syracuse proper, along with many of the outlying suburbs and the Onondaga Nation. The "hotter" the color on the above map, the stronger the signal strength should be. The "blue" areas of the map, for example, will be car listening only, while clock radios and other poor receivers should be able to pick up the signal in the "red" areas. The FCC approved this application in January 2014, even though it was originally filed all the way back in March 2003. This is a "translator", which means it will repeat an FM signal originating on a different FM frequency and in our case, that will be our new Syracuse LPFM station. In November 2013, SCR applied for a low power FM station (LPFM) just outside the City of Syracuse to replace our existing 49 watt signal outside Cazenovia, New York that currently can only be heard clearly in that general area. LPFM stations are limited to a maximum of 100 watts and this was the first ever opportunity to apply for one in Syracuse, so we felt the opportunity too good to pass up. FCC regulations don't allow us to own both an LPFM and our existing Fenner station, but we feel trading our existing Madison County signal for one just outside the City of Syracuse an easy decision. This will allow us to finally bring community radio to Syracuse and most of Onondaga County and we'll have more details about this very soon!